With cold and flu season around the corner, it’s a good time to think about restocking the home medicine kit with natural remedies. Black elderberries are truly unique nutritional powerhouses that possess biologically active health-benefiting components. Nutritional analysis shows that black elderberries provide protein, omega-3 essential fatty acids, free and conjugated forms of amino acids, fiber, vitamins, minerals and high levels of calcium, potassium and vitamin C, as well as powerful and potent antioxidants. The extraordinary level of antioxidants is largely attributed to anthocyanins, flavonols, proanthocyanidins and phenolic acids that surpass the antioxidant capacity of other dark-fleshed small fruits, such as blueberries, blackberries and black raspberries. Commonly used as daily support for its immune boosting properties, as well as for acute immune challenges, elderberry can be found as syrups, lozenges, capsules, and tonics. The fruit is also used to make jams and baked goods, while teas, wines, cordials and sodas are often made from the elderflower. Recorded history shows that the use of black elderberry (Sambucus nigra) as medication dates back to ancient times. 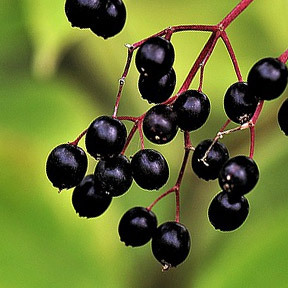 Black elderberry’s healing powers were valued by Hippocrates who reportedly described elderberry as his “medicine chest” for the wide variety of ailments it appeared to treat. Over the centuries, black elderberry has been utilized for the treatment of colds, flu, swelling, and over 70 other maladies. Today, research data obtained from studies around the world have found black elderberry to be an efficient, safe and cost-effective way to reduce the symptoms of colds, fevers and flu. By stimulating the immune response, elderberry has been shown in studies to shorten the duration of influenza A, B and H1N1 illness by an average of four days. Per Dr. Gerhard Rechkemmer, president of Germany’s Federal Research Institute for Nutrition and Food, black elderberries have significantly greater antioxidant capacity than other antioxidant nutrients such as vitamin C. Research at the Institute has shown that anthocyanins found in elderberries boost the production of cytokines, which helps to balance and enhance the immune response. Cytokines, a family of cell signaling molecules, aid cellular communication between compounds, such as interferon and interleukin, that regulate immune and inflammatory responses. Also described as immunomodulating agents, cytokines are important regulators of both the innate and the adaptive immune response to inflammation, infection and trauma. The medicinal properties of elderberries are largely associated with the presence of polyphenol antioxidant compounds. Antioxidants scavenge and neutralize free radicals to counteract oxidative stress, thereby helping to protect against cellular aging, degenerative diseases, infections and certain cancers. Anthocyanins in elderberries have been shown to be absorbable by the body and are able to significantly increase plasma antioxidant capacity. For generations, elderberry has been traditionally used to relieve constipation, gingivitis, nerve pain, upper respiratory tract infections, and chronic fatigue, as well as to relieve cold and flu symptoms of coughing, nasal congestion, mucus discharge and fever. Elderberry’s significant antioxidant capacity is well documented. It is known to be immunoprotective, immunostimulatory, and antiviral, and it also increases production of inflammatory and anti-inflammatory cytokines. Elderberries should always be cooked before consumption. As not all species of elderberry are edible, it’s never a good idea to eat wild elderberries. Individuals who are pregnant, breastfeeding, have a medical condition or are taking medications should consult a healthcare practitioner before using elderberry products. Black Elderberry Extract by Ecological Formulas: Formulated to deliver specially isolated derivatives of black elderberry juice, this extract provides a high concentration of polyphenols including anthocyanidins. Honey sweetened. Gluten and casein free. Sambucus Black Elderberry by Protocol for Life Balance®: This concentrated liquid tonic provides 500 mg of black elderberry in support of health maintenance, overall wellbeing and free radical scavenging. Free of yeast, wheat, gluten, soy, milk, eggs, fish and shellfish. Non- GMO vegan formulation. Black Elderberry by Professional Solutions: Designed for optimal support of healthy immune function, this product supplies 158 mg of certified organic dried black elderberry extract per capsule. No sweeteners, binders or fillers. Vegetarian formulation. Kids Black Elderberry Syrup by Gaia® Herbs: This great tasting, all natural syrup is made from USDA Certified Organic black elderberries with added organic honey. Black Elderberry Syrup may be taken daily or when needed for additional immune support. Free of artificial ingredients and high fructose corn syrup. Non-GMO formulation.